Favorite food: Sweet potatoes and her nightly banana—but she’ll eat anything! Favorite activity: Her favorite activity involves her favorite foods…EATING! Speedy has one of the heftiest appetites at the sanctuary. Speedy is one of Arun Rangsi and Shanti’s children, and she was born after Arun Rangsi’s first vasectomy failed. 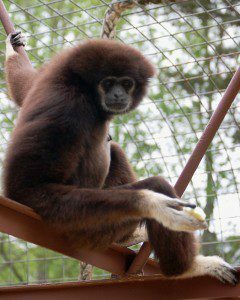 Gibbon vasectomies are a tricky process and are sometimes left unfinished which means that the males can still breed, and Speedy is proof of that! When Speedy matured, we started seeing tensions between her and Shanti. so we removed her and placed her with Maui, who had come to IPPL from the Maui Zoo in 1996. Maui had previously lived with Speedy’s feisty older sister, Michelle, who had bitten him! Maui and Speedy would spend most of their day wrestling with one another but unfortunately Maui liked to watch the other female gibbons and Speedy would become very jealous. Eventually the tension between Maui and Speedy got a little too intense for our liking, so they were separated. Speedy doesn’t seem to mind being a bachelorette though; at least now she doesn’t have to share her food! Speedy is an extremely active gibbon who enjoys wrestling and flying through the ropes and pieces of fire hose we provide to them for enrichment and ease of brachiating (gibbon locomotion involving swinging with their arms). She generally keeps to herself, but always comes forward for special treats. She was once given an enormous soup carrot whole to see what she would do with it. She snatched it hungrily and sat on top of her tower crunching on it until the entire thing was gone!